This article is about the town of Falkirk. For the council area, see Falkirk (council area). For other uses, see Falkirk (disambiguation). Falkirk (/ˈfɔːlkɜːrk/; Scots: The Fawkirk; Scottish Gaelic: An Eaglais Bhreac) is a large town in the Central Lowlands of Scotland, historically within the county of Stirlingshire. 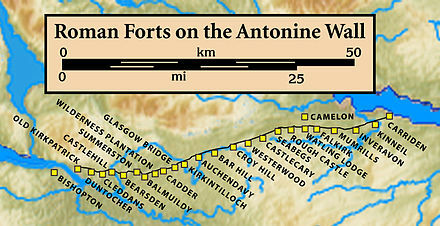 It lies in the Forth Valley, 23.3 miles (37.5 km) north-west of Edinburgh and 20.5 miles (33.0 km) north-east of Glasgow. Falkirk had a resident population of 32,422 at the 2001 UK Census. The population of the town had risen to 34,570 according to a 2008 estimate, making it the 20th most populous settlement in Scotland. Falkirk is the main town and administrative centre of the Falkirk council area, which has an overall population of 156,800  and inholds the nearby towns of Grangemouth, Bo'ness, Denny, Larbert and Stenhousemuir. The town is at the junction of the Forth and Clyde and Union Canals, a location which proved key to its growth as a centre of heavy industry during the Industrial Revolution. In the eighteenth and nineteenth centuries, Falkirk was at the centre of the iron and steel industry, underpinned by the Carron Company in nearby Carron. The company was responsible for making carronades for the Royal Navy and later manufactured pillar boxes. Within the last fifty years, heavy industry has waned, and the economy relies increasingly on retail and tourism. Despite this, Falkirk remains the home of many international companies like Alexander Dennis; the largest bus production company in the United Kingdom. Falkirk has a long association with the publishing industry. The company now known as Johnston Press was established in the town in 1846. The company, now based in Edinburgh, produces the Falkirk Herald, the largest selling weekly newspaper in Scotland. Attractions in and around Falkirk include the Falkirk Wheel, The Helix, The Kelpies, Callendar House and Park and remnants of the Antonine Wall. In a 2011 poll conducted by STV, it was voted as Scotland's most beautiful town, ahead of Perth and Stirling in second and third place respectively. An Eaglais Bhreac is a derivative formed from the Scottish Gaelic cognate of the first recorded name Ecclesbrith from the Brittonic for "speckled church", presumably referring to a church building built of many-coloured stones. The Scottish Gaelic name was translated into Scots as Fawkirk (literally "variegated church"), then later amended to the modern English name of Falkirk. The Latin name Varia Capella also has the same meaning. Falkirk Old Parish Church stands on the site of the medieval church, which may have been founded as early as the 7th century. The Antonine Wall, which stretches across the centre of Scotland, passed through the town and remnants of it can be seen at Callendar Park. Similar to Hadrian's Wall but built of turf rather than stone so less of it has survived, it marked the northern frontier of the Roman Empire between the Firth of Forth and Firth of Clyde during the AD 140s. Much of the best evidence of Roman occupation in Scotland has been found in Falkirk, including a large hoard of Roman coins and a cloth of tartan, thought to be the oldest ever recorded. A Roman fort was confirmed to be found by Geoff Bailey in the Pleasance area of Falkirk in 1991. A Roman themed park at Callendar House was awarded lottery funding to help raise awareness of the wall. In the 18th century the area was the cradle of Scotlands's Industrial Revolution, becoming the earliest major centre of the iron-casting industry. James Watt cast some of the beams for his early steam engine designs at the Carron Iron Works in 1765. The area was at the forefront of canal construction when the Forth and Clyde Canal opened in 1790. The Union Canal (1822) provided a link to Edinburgh and early railway development followed in the 1830s and 1840s. The canals brought economic wealth to Falkirk and led to the town's growth. Through time, trunk roads and motorways followed the same canal corridors through the Falkirk area, linking the town with the rest of Scotland. Many companies set up work in Falkirk due to its expansion. A large brickworks was set up at this time, owned by the Howie family. During the 19th century, Falkirk became the first town in Great Britain to have a fully automated system of street lighting, designed and implemented by a local firm, Thomas Laurie & Co Ltd. The Battle of Falkirk fought on 22 July 1298, saw the defeat of William Wallace by King Edward I of England. The Battle of Falkirk Muir took place on 17 January 1746, the Jacobites under Charles Edward Stuart defeated a government army commanded by Lieutenant General Henry Hawley. A map showing the boundaries of the Falkirk Council area, one of the 32 unitary authorities of Scotland. The town of Falkirk sits at the heart of the council area. In terms of local government the town sits at the heart of Falkirk Council area, one of the 32 unitary authorities of Scotland formed by the Local Government etc (Scotland) Act 1994. The headquarters of the council are located in the Municipal Buildings, adjacent to Falkirk Town Hall, on West Bridge Street in the centre of town. The Council has been led by an SNP minority since 2017. The current Leader of the Council is Cllr Cecil Meiklejohn. Falkirk is located within the Scottish parliamentary constituency of Falkirk West which elects one Member of the Scottish Parliament (MSP) under the first past the post system. The current MSP is Michael Matheson, who won the seat at the 2007 Scottish Parliament General Election. The previous MSP, Dennis Canavan, who sat as an Independent, was elected with the largest majority in the Scottish parliament representing Falkirk's electorate's displeasure with New Labour, but stepped down in 2007 for family reasons. Canavan, who announced in an open letter to his constituents in January 2007, that he was stepping down from representative politics at the Scottish Parliament election, 2007 had been an MSP or MP for the area for over 30 years. The constituency of Falkirk West also sits in the Central Scotland Scottish Parliament electoral region which returns seven MSPs under the additional member system used to elect Members of the Scottish Parliament. In the Parliament of the United Kingdom, the town is entirely contained within the UK parliamentary constituency of Falkirk which elects one member to the House of Commons under the plurality system. The constituency also takes in surrounding villages and is currently represented by John McNally of the Scottish National Party. Traditionally, Falkirk had been seen as a stronghold for the Labour Party. At EU level, Falkirk is part of the pan-Scotland European Parliament constituency which elects six Members of the European Parliament (MEP)s using the d'Hondt method of party-list proportional representation. Falkirk is located in an area of undulating topography between the Slamannan Plateau and the upper reaches of the Firth of Forth. The area to the north of Falkirk is part of the floodplain of the River Carron. Two tributaries of the River Carron - the East Burn and the West Burn flow through the town and form part of its natural drainage system. Falkirk sits at between 50 metres (164 ft) and 125 metres (410 ft) above sea level. The underlying geology of the town of Falkirk is characterised by glacial deposits. Elevations above 100 metres (328 ft) are covered by a mixture of glacial till and boulder clay with low-lying areas covered by sandy soils and loams. As Falkirk is not far from the coast, post-glacial features akin to raised beaches are particularly predominant to the north of the town centre, and this gives rise to differing elevations within the town. Unsorted glacial till gives rise to such features of glacial deposition as eskers, and drumlins which are predominant over much of the area. Such elements provide natural transport routes and it is this complex underlying geology that the town is built upon. Like much of the rest of Scotland, Falkirk has a temperate maritime climate, which is relatively mild despite its northerly latitude. Winters are especially mild given that Moscow and Labrador lie on the same latitude, with daytime temperatures rarely falling below freezing, or 0 °C (32 °F). Summer temperatures are comparatively cool, with daily upper maxima rarely exceeding 23 °C (73 °F). The proximity of the town to the sea mitigates any large variations in temperature or extremes of climate. The prevailing wind direction is from the south-west, which is associated with warm, unstable air from the Gulf Stream that gives rise to rainfall. Winds from an easterly direction are usually drier but colder. Rainfall is distributed fairly evenly throughout the year. Vigorous Atlantic depressions - sometimes called European windstorms can affect the town between October and March. The highest recorded temperature was 31.5C in August 2010. The United Kingdom Census 2001 identified the town as having a total resident population of 32,422. The population was estimated at 34,570 in 2008 which makes the town the 20th most populous settlement in Scotland. The wider Falkirk area which includes Grangemouth, Larbert and Stenhousemuir has an overall population of 98,940 making this the 5th largest urban area after Glasgow, Edinburgh, Aberdeen and Dundee. The population of the town and surrounding area is forecast to grow over the next ten years, primarily due to net in migration from other parts of Scotland and the UK. Unemployment in the Falkirk area is low at 2.5%, below the Scottish average, but average household income and gross weekly pay are below the comparative Scottish and UK averages. Today, the economy of Falkirk is focused on retail and services, in contrast to the heavy industries and manufacturing sectors which contributed to the growth of the town over the last 300 years. Falkirk is a large retail centre catering to the town itself and a wide surrounding area, stretching from Cumbernauld in the west to Bo'ness in the east. The flagship retailer Marks and Spencer opened a store in Falkirk in 1936. The High Street was pedestrianised in the late 1980s and the Howgate Shopping Centre opened in  1989. A number of supermarkets including Tesco, Asda, Morrisons and Scottish Co-op have developed on peripheral sites surrounding the town centre in recent years. The public sector and public services also have a foothold in the Falkirk area. Falkirk Council is one of the largest employers in this sphere, with a workforce of over 7,000, many based at the council headquarters in the town centre. One of the principal offices of the UK Child Support Agency, covering Scotland and the north east of England, is located in the Callendar Business Park on the outskirts of Falkirk. Similarly the National Health Service (NHS) and Department for Work and Pensions have a presence in the town and employ local residents. Many Falkirk residents are also employed within the petrochemicals sector based in neighbouring Grangemouth where there is an agglomeration of such industries underpinned by the Ineos (formerly BP) oil refinery located there. Alexander Dennis, one of the world's largest bus manufacturers, is headquartered in Falkirk with the operations plant located nearby. Falkirk is administered by NHS Forth Valley, this includes the unitary authorities of Falkirk, Stirling and Clackmannanshire. Following the opening of the new Forth Valley Royal Hospital, the Falkirk and District Royal Infirmary was renamed Falkirk Community Hospital with many of the main services, including the accident and emergency unit being transferred. Falkirk Community Hospital will still provide many services like podiatry and palliative care. The Community Hospital continues to have a Minor Injury Unit, to treat emergency cases of a non life-threatening nature. In-patient and community services at Bonnybridge Hospital will re-locate to Falkirk Community Hospital in 2012, once new modern, en-suite accommodation has been developed. A new purpose built dental centre, Langlees Dental Centre, provides a "teach and treat" dental centre in the Langlees area of Falkirk opened in August 2009. It has seven dental surgeries and is involved in training final year students at Glasgow Dental School. The Falkirk Area occupies a central position in Scotland, with direct access from the key north-south and east-west motorway networks; the M9 from the north and east, and the M876 from the west. Falkirk has main rail and canal routes within easy reach from Edinburgh and Glasgow and is central to access to both Glasgow and Edinburgh airports. Falkirk is well situated both for access by rail from England and for access to other parts of Scotland excluding Fife, which has no direct rail link to Falkirk other than morning and evening commuter services from Kirkcaldy to Glasgow. Road access is to Fife provided by the Kincardine Bridge, Clackmannanshire Bridge and the Forth Road Bridge via the M9. The view from the footbridge at Falkirk Grahamston, looking east. Falkirk has two railway stations; Falkirk High and Falkirk Grahamston. Falkirk High is on the main Glasgow-Edinburgh line, with connections to either city running on a 15-minute frequency. At peak times 8 trains per hour stop; 4 for Glasgow Queen Street via Croy and 4 for Edinburgh Waverley via Polmont and Linlithgow. Journey times to Edinburgh vary from 27 minutes to 38 minutes depending on stopping stations and time of day; to Glasgow the journey time is between 23 and 26 minutes. Falkirk Grahamston lies on the Edinburgh to Dunblane Line. Trains from Glasgow Queen Street on the Cumbernauld Line terminate at Falkirk Grahamston. There is also a daily direct service to/from London (King's Cross) provided by London North Eastern Railway, and the Caledonian Sleeper to London Euston in the southbound direction only also calls here. The main station building was opened in 1985 and serves over 950,000 passenger journeys each year. Falkirk bus station lies in the town centre and has bus routes providing links to the cities of Stirling, Edinburgh and Glasgow as well as local routes. Falkirk is home to one of the four campuses of Forth Valley College which was formed on 1 August 2005 from the merger of Falkirk, Stirling and Clackmannan colleges. The Falkirk Campus is by far the largest of the four campuses. Falkirk District is served by eight high schools which have all been recently rebuilt. Falkirk hosted a national arts festival which ran in Callendar Park from 2000-2009 called Big In Falkirk. After its inception in 2000, the festival won Scottish Thistle Award for Events & Festivals in 2005. Consisting of a free weekend of events, the festival was one of the largest cultural events in Scotland, attracting over 100,000 people. Hosted in Falkirk’s historical Callendar Park, the venue covers 180-acre (0.73 km2) with Callendar House as the focal point, the entertainment featured a wide variety of outdoor theatre, pyrotechnic displays, arts, comedy and big name music acts, alongside activities for all ages. Falkirk hosted the Royal National Mòd in 2008. The Gold medals were won by Falkirk resident Lyle Kennedy and Kerrie Finlay from Inverness. Interest in Gaelic has grown in Falkirk since the Mod and there are now five Gaelic organisations active in the Falkirk area: An Clas Gàidhlig (provides Gaelic lessons to adults), An Comunn Gàidhealach Meur na h-Eaglaise Brice (is the local branch of An Comunn Gàidhealach), Fèis Fhoirt (provides traditional music and Gaelic song tuition for children and adults), Falkirk Gaelic Forum (promotes Gaelic in Falkirk) and Falkirk Junior Gaelic Choir (is a long established and successful youth choir). Falkirk is served by a weekly newspaper, the Falkirk Herald, which is published by Johnston Press. The company was established by the Johnston family from Falkirk, who have been involved in publishing since 1767. The family acquired the Herald, their first newspaper, in 1846. The publishing company was renamed F Johnston & Co Ltd in 1882, a title it would retain until it was floated on the London Stock Exchange as Johnston Press in 1988. The corporate headquarters of Johnston Press are now in Edinburgh, but the company retains two offices in Falkirk and Grangemouth. The historical Callendar House is an imposing mansion with a 600-year history which is now a museum and also has a cafe and shop. The Park Gallery, a contemporary art gallery is also based in the house. The Falkirk Wheel, the only rotary canal connector in the world, is located within Falkirk. The attraction was completed in 2002 and it connects the Forth and Clyde Canal to the Union Canal. In Falkirk High Street lies the Falkirk Steeple, the current building was built in 1814 and is protected as a category A listed building. A stylised image of the steeple appears on the crest of Falkirk Football Club. It is widely regarded as the centre point of the town. The 2001 census showed the majority of the population claim to belong to one of the Christian denominations with 48% of these being Church of Scotland, 12% being Roman Catholic, and 5% belonging to other Christian denominations. A percentage of people (29) belong to no religion, about 1% above the national figure. The Church of Scotland's Presbytery of Falkirk includes congregations in Bo'ness, Bonnybridge, Cumbernauld, Grangemouth and Larbert, as well as Falkirk. Falkirk currently has two men's football teams, Falkirk Football Club and East Stirlingshire Football Club. Falkirk F.C. was founded in 1876 and was elected to compete in the Scottish Football League in 1902. The club's highest ranking came in the 1907–08 season and once again in 1909–10 when the club finished runners-up of Division One, the country's top football division, losing out to Celtic F.C. on both occasions. The club has reached the final of the Scottish Cup on five occasions, emerging victorious twice in 1913 and 1957 respectively. The club currently competes in the Scottish Championship and plays their home games at the Falkirk Stadium near Grangemouth. The town's other men's club, East Stirlingshire F.C., was founded in 1881 originally as Bainsford Britannia and has competed in the Scottish Football League since 1900. The club has predominantly played in the lower leagues of Scottish football, spending only two whole seasons in the top division after being promoted from Division Two in 1931–32 and 1962–63. The club currently competes in the Lowland Football League and from the 2018-19 season will play their home games at the Falkirk Stadium following a groundshare agreement with Falkirk F.C. Firs Park was the home of the club for the majority of the club's existence but was vacated at the end of the 2007/08 season. Falkirk currently has two women's football teams, Central Girls Football Academy and Falkirk Ladies. Central play in the second tier (SWPL2) and Falkirk play in the third tier (SWFL) of women's football. Falkirk is home to Scotland's first Co-ed Roller Derby League. Clubs from the area are the Skelpies men's team, the Central Belters women's team and the Belter Skelpers Co-ed team. Falkirk Rugby Club can trace their roots to 1906 when F.R.F.C. was first formed. It was disbanded at the start of World War 1. In 1972 the club was resurrected when the works team from ICI Grangemouth decided to become "open" and looked for a new home. They initially played at Stirling Road playing fields before building their clubhouse at the present site at Sunnyside in 1981. The club has risen through the ranks of rugby winning six consecutive promotions, five of them as league champions, a Scottish record. Falkirk also has a Hockey team, Falkirk GHG Hockey Club, which was formed from the merger of Graeme High School Former Pupils Hockey Club and Grangemouth Hockey Club in 1999. It now has four men's teams which play in various leagues, with their first team playing in the national league. Falkirk Fury Basketball Club, currently called Clark Eriksson Fury Basketball Club in a sponsorship deal with local firm Clark Eriksson, represents the town in the sport. The team was established in 1992 and originally consisted of players from Falkirk High School and sports development players. Today the team competes in all 6 Scottish National Age Groups. The men's side currently competes in the Scottish Men's National League, the top league in Scottish basketball and is considered the second tier of British basketball below the BBL and in line with the English Basketball League. The club plays home games at the Mariner Centre in Camelon or sometimes at the Grangemouth sports complex. Falkirk Company of Archers was established in 1971 and is affiliated to the Scottish Archery Association (SAA) which is a region of the national governing body; Archery GB. During summer members shoot outdoors on Sunnyside playing feels and during winter members shoot indoors at Woodlands Games Hall. The club is a target archery club with most members shooting recurve bow, though traditional archery has made a resurgence in the club recently with some members shooting barebows, horse bows and longbow. The Earls of Callendar and Linlithgow - were seated in the centre of Falkirk, at Callendar House, before being stripped of their titles. Other peers historically connected to the area include the Marquess of Zetland whose estate was in Grangemouth, the Earl of Dunmore who owned the nearby Pineapple, Lord Thurlow of Kinnaird, the Duke of Montrose and the Duke of Hamilton. The Bolton baronets of Carronhall were also seated near Falkirk, as were the Bruce baronets of Stenhouse, of whom the actor Nigel Bruce was a member, growing up at Stenhouse Castle. John Aitken - physicist and meteorologist, operated from a laboratory in his home in Falkirk, where he first detected atmospheric dust particles using the koniscope, his invention. Bill Buchanan (professor) - Leading computer security expert and author of many academic books. George Forrest - a Scottish botanist. Famous for bringing back over 30,000 specimens of 10,000 plants mostly from the Yunnan Province of China. Eric Vance - Chemist responsible for the coloration of Nomex, the essential fabric of most military uniforms, effectively designing the future of camouflage. Brown Ferguson - former footballer & current Manager of Stenhousemuir F.C. ^ "Geographic coordinates of Falkirk, United Kingdom". dateandtime.info. Retrieved 11 December 2014. ^ "Falkirk factsheet" (PDF). gro-scotland.gov.uk. Archived from the original (PDF) on 4 October 2013. Retrieved 3 October 2013. ^ "Scots Online". Scots Online. Retrieved 20 March 2018. ^ Historic Environment Scotland. "Old Parish Church and burial ground including boundary walls and railings (Category A) (LB31167)". Retrieved 18 April 2019. ^ "THE ROMANS". Falkirk Local History Society. Retrieved 28 November 2017. ^ "New Roman-themed park plan for Falkirk's youngsters". Falkirk Herald. 6 October 2018. Retrieved 6 October 2018. ^ a b "Falkirk Council - About the Council". Falkirk Council. Retrieved 2007-01-30. ^ "Falkirk Council - Committee Appointments". Falkirk Council. Archived from the original on 13 March 2009. Retrieved 2009-05-11. ^ "Falkirk Council - Council Members". Falkirk Council. Archived from the original on 8 March 2007. Retrieved 2007-01-31. ^ a b "Previous Elections - 2003 Scottish Parliamentary Election - Falkirk West". The Scotsman. Retrieved 2007-01-31. ^ Louise Gray (24 January 2007). "'I'm filled with regret that I didn't spend more time with family'". The Scotsman. Retrieved 2007-01-31. ^ "Scottish Parliament Electoral System" (PDF). Scottish Parliament Information Centre (SPICe). 31 August 2006. Archived from the original (PDF) on 25 January 2007. Retrieved 2007-01-30. ^ a b "All Scottish Seats - 2005 UK General Election - Falkirk". The Scotsman. Retrieved 2007-01-31. ^ "Falkirk 1981–2010 averages". Station, District and regional averages 1981–2010. Met Office. Retrieved 7 August 2017. ^ "Mid-2008 Population Estimates – Localities in alphabetical order" (PDF). 2008. Archived from the original (PDF) on 14 June 2011. Retrieved 2011-02-13. ^ "Mid-2008 Population Estimates – Settlements in alphabetical order" (PDF). 2008. Archived from the original (PDF) on 19 March 2012. Retrieved 2011-02-13. ^ "Falkirk as a Location, Statistical Information on the Council Area" (PDF). Falkirk Council. December 2006. Archived from the original (PDF) on 22 August 2007. Retrieved 2007-03-22. ^ "Falkirk - Scotland and North East England Business Unit". Child Support Agency. Archived from the original on 23 December 2012. Retrieved 2007-01-30. ^ David Gibson (13 November 2001). "BP Grangemouth announcement - Scottish Enterprise Forth Valley reaction". Scottish Enterprise. Archived from the original on 27 September 2007. Retrieved 2007-01-30. ^ "Alexander Dennis, Key facts". Alexander Dennis. Archived from the original on 5 February 2007. Retrieved 2007-01-30. ^ "NHS Forth Valley Emergency Services". NHS Forth Valley. Archived from the original on 24 February 2007. Retrieved 2007-03-22. ^ "South East & Central Scotland timetables". First Group. 2011. Retrieved 2011-03-05. ^ "Scottish Thistle Award winners from 1992 - 2009". Scottish Thistle Award. Archived from the original on 22 November 2010. Retrieved 2010-09-05. ^ "Park Gallery". Falkirk Council. Archived from the original on 15 October 2009. Retrieved 2009-09-27. ^ "Insight 2001 census no2" (PDF). Falkirk Council. 1 February 2003. Archived from the original (PDF) on 21 June 2011. Retrieved 2008-04-18. ^ "Fixtures, Results & League Tables - Scottish Womens Football". scotwomensfootball.com. Retrieved 20 March 2018. ^ "Historic roller derby bout set for this month". kirkintilloch-herald.co.uk. Retrieved 20 March 2018. ^ a b c Clark Eriksson Falkirk Fury Basketball Club Archived 13 April 2013 at the Wayback Machine, Retrieved 2012-02-10. ^ "British towns twinned with French towns [via WaybackMachine.com]". Archant Community Media Ltd. Archived from the original on 5 July 2013. Retrieved 2013-07-20. ^ "John McAleese: Leader of the SAS team that ended the 1980 siege of the". independent.co.uk. 30 August 2011. Retrieved 20 March 2018. ^ Taylor, Steven (1 October 2017). "Story of heroic Scots-born SAS soldier to be turned into Netflix blockbuster". dailyrecord.co.uk. Retrieved 20 March 2018. ^ "Nobels Factory in Redding was an explosive place". falkirkherald.co.uk. Retrieved 20 March 2018. Milne, D; Leitch, A; Duncan, A; Bairner, J & Johnston, J (1975): "The Falkirk and Grangemouth Area". Paper for the Scottish Association of Geography Teachers' (SAGT) conference, October 1975. Moray House College of Education, Edinburgh. Nimmo W (1880): "The History of Stirlingshire, Third Edition" Vol II. Hamilton, Adams and Company, Glasgow. Wikivoyage has a travel guide for Falkirk. Wikimedia Commons has media related to Falkirk.